Flexible module layout and adjustable inlays, grippers and clamp shapes. The practical job preparation tool is enabled to integrate with MES and ERP systems. Your tool for larger outputs and smaller stocks. Handles different shapes, sizes and weights. Skid grows along with your company, from a Base, Extended to Completed version. Skid allows for deeper integration in your production process. Modularity and functionality are masterfully combined in the Skid. 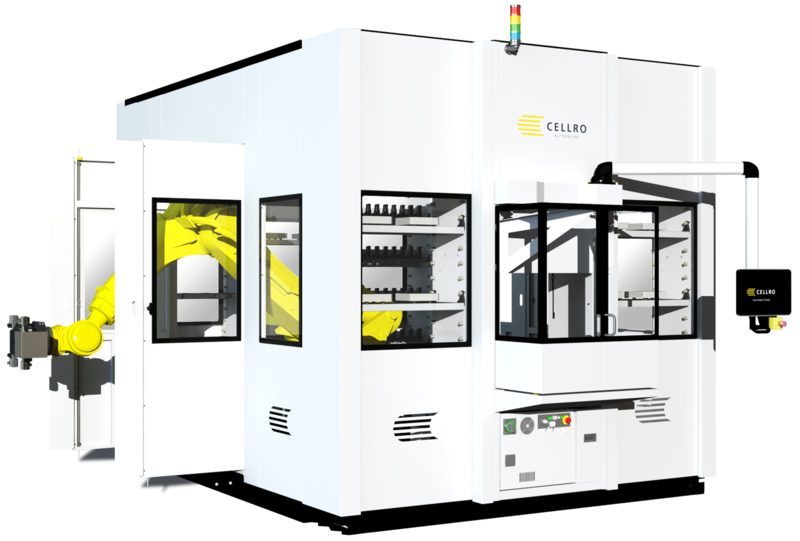 Due to the system’s modular design, automation can grow with the customer’s production process. And because both functionalities as well as pallet and product handling can be added to and interchanged, Skid is an efficient solution for automating one to two machines. Skid is often used for handling single pallets of more than 125 kg, in combination with product handling. Tool handling can be added if the machine controls can be modified to allow for this. Skid is controlled via intelligent and user-friendly software that gives the operator lots of information to help them optimise the production process. The software can also be integrated with the top-layer MES and ERP software. The machine gate ensures the machine stays accessible. Skid can be used for product batches of 1 to 500 units. Skid often handles products that have a cycle time of 6 to 60 minutes per product. Skid’s modularity allows it to be expanded/converted into the Track system. Find out more about Skid?